Traditionally, laboratories have used absorption spectroscopy to perform precise analyses. In production environments, a very robust portion of the electromagnetic spectrum emerged for process analytics (UV, Vis, NIR). Even though data from NIR used to be a challenge to interpret because of broader peaks that overlap than those seen in the IR region, the NIR region is rich in information and has several advantages when used in a process environment. One such advantage is the reliability of the performance of online fiber-optic coupled analyzers. The analyzer can be placed in a safe environment away from the sample interface in the process stream. This gives the process engineer or operator simultaneous, real-time information for several different parameters whilst it occurs in the process. Software tools have evolved to make interpretation routine and the interpretation is performed automatically to provide information that is actionable to the operator. Reliability engineers and process analyzer professionals are well experienced in NIR-based analyzer system deployment throughout their plants. 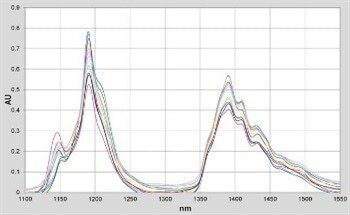 One of the main benefits of an NIR spectrometer analyzer is the ability to measure samples quickly and accurately while keeping the main analyzer away from any process which could be potentially dangerous. Fiber optics cables which connect the sample interface (flow cell, insertion probe, vapor cell etc.) to the analyzer make this possible. There is a potential source of error when carrying light energy over a distance through a light conduit (optically efficient fiber optic cables) because the light travels to the optical probe from the spectrometer and then back for analysis. For optimal performance, it is important that all the components within the whole analyzer system be tuned to work efficiently together. All spectrometers, fiber optic cables, optical probes (sample interfaces) and photometers at Guided Wave are designed and tested so that optimal transmission and compatibility are ensured. 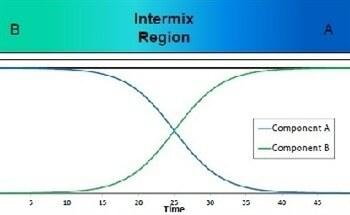 The improvement in transmission causes the data from NIR to be more accurate and therefore more accurately analyzed. The essential optical element of the analyzer is a plane (flat) diffraction grating. This is made up of an aluminum-coated mirror, the surface of which is etched with thousands of parallel and equally spaced grooves. The etched surface is especially delicate, and so should never be cleaned or touched. A diffraction grating is one of the most precise objects ever made — the way in which a grating functions is described in all good introductory college level physics textbooks. This article will review several of the facts behind the grating’s function, as they are important to the correct operation of the analyzer. This equation describes the dispersion of white light into its fundamental wavelengths (e.g., the individual colors in the case of visible light). White light enters the monochromator via an entrance fiber in the housing of the multiplexer. The light is then dispersed onto the output module fiber array by the grating, from which it is directed towards the detector module. The intensity of the light impinging on the detector is then measured, with a spectrum recorded by rotating the grating. 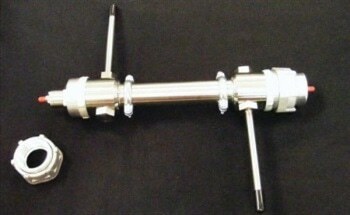 The analyzer is programmed to self-calibrate using the insertion of a traceable rare-earth standard filter from NIST which is mounted on the filter wheel. As a result, the grating angles can be translated accurately into the wavelength axis, which is presented in a typical spectral scan. It is imperative, however, that the user understands the importance of the order of the grating integer, m. For zero order, i.e. m = 0, the angles of incidence and diffraction are equal but have opposite sign. This is the condition that occurs for a mirror – no dispersion is observed, and white light is seen at the exit fiber. Zero-order is solely used during the initial calibration process and so if of little concern. The spectrometer is designed to work primarily in the first order, m = 1. Under certain conditions however, second order (i.e. m = 2) light may reach the detector. This light will have a negative impact on the resulting absorption measurements, affecting the photometric linearity. For example, 1000 nm light will naturally appear at 1000 nm in the first order, but can also in principle be detected at 2000 nm in the second order, and similarly at 3000 nm in the third order. If the instrument is fitted with an extended range InGaAs detector sensitive to light between 900 and 2150 nm, second order light will begin to be observed at about 1950 nm, as a 975 nm long pass filter is permanently mounted inside the lamp housing. This second order light is not desired, and hence must be filtered out. Generally, an order sorting (long pass) filter is inserted into the optical path to prevent interference with first order analytical measurements from second order radiation from occurring. 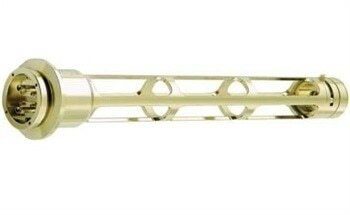 This filter is included in the lamp assembly as a 1550 nm long pass filter (LP1550). 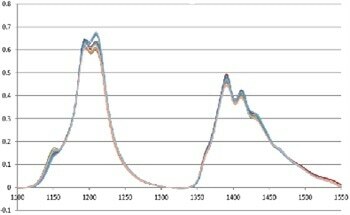 For spectra recorded at wavelengths beyond 1900 nm, it is recommended that the long pass option, found in the setup screen of the analyzer control software, is used, and that the LP1550 filter is inserted at a point in the spectra that has no, or little, required spectral information. This insertion point can be chosen at any point between 1550 nm and 1950 nm. 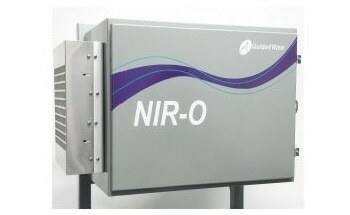 Near-infrared (NIR) spectroscopy provides a non-destructive measurement technique that can offer fast, accurate results for your process without the downsides of gas chromatography (GC); namely high maintenance costs and extensive upkeep considerations. 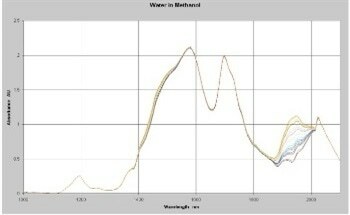 Guided Wave uses its optical technology to bring light to the sample, enabling the expensive sample systems and fast loops required by process gas chromatography to be eliminated, while providing faster results. This information has been sourced, reviewed and adapted from materials provided by Guided Wave. For more information on this source, please visit Guided Wave.